John MITCHELL b. 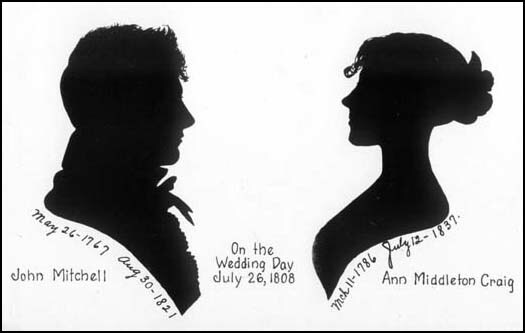 1767 Donegal, Ulster, Ireland, d. 1821 VA., married 1808 July 26 in , Washington, Virginia to Ann Middleton CRAIG b. 1786 VA . d. 1837 Randolph, MO. Obtained from Dorothy Mitchell McClure.